Located 12 miles south of Denver, Highlands Ranch is a 22,000 acre master planned community that offers a wonderful quality of life. It has been nationally recognized as 21st on the list of 100 best places to live by Money Magazine, 'One of the top places to move' by Forbes magazine and was also named by Business Week as one of the best places to raise children. There is a population of 86,960 here and the median home sale price is $324,500. With 25 parks, over 70 miles of trails and 22,000 acres of natural open space areas, Highlands Ranch caters to those with an active lifestyle. Eighty-five percent of the homes here are located within a quarter mile of a park, open space area or trail. There are approximately 25 acres of park land per 1,000 residents. Some of the park features here include two skate parks, an inline hockey rink, four dog parks, eight lighted tennis courts, three lighted ball fields and three community gardens. The centerpiece of this community is the spectacular 120 year old Highlands Ranch Mansion. After undergoing an eighteen-month renovation, the mansion serves as a focal point of the community and hosts community events, cultural arts programs, educational opportunities, weddings and special occasions and business conferences. It is an amazing place where residents can gather, celebrate and experience the lifestyle of years gone by at this western estate. The primary school district here is Douglas County Re-1 and most students attend Highlands Ranch High School. Other notable schools in the area are the Plum Creek Academy which offers a 4.6/1 student-teacher ratio, and Highlands Ranch Christian School. In all there are 30 schools in the Highlands Ranch area. Interstate 470 borders Highlands Ranch to the north and provides easy access to Red Rocks Amphitheater, Boulder, and Summit County Skiing, as well as to DIA. I-25 to the east provides easy access to Denver area attractions to the north and Castle Rock, the Air Force Academy and Colorado Springs to the south. So, with its nationally recognized high quality of life, open spaces, trails and park along with the sense of a tight-knit community and close-by major metropolitan areas, Highlands Park is a great place to consider buying real estate. 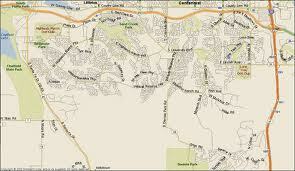 Search the #1 site for Highlands Ranch Real Estate listings.